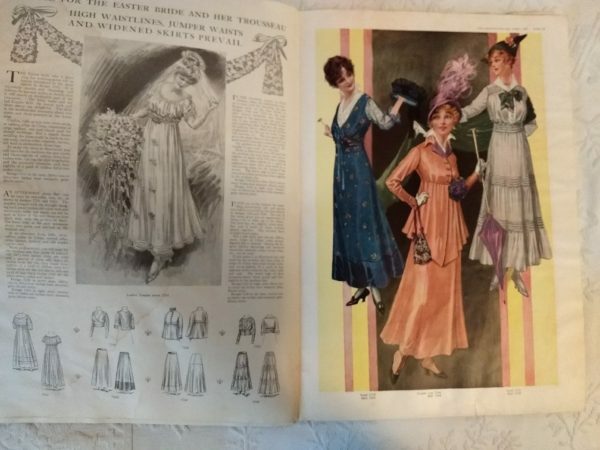 A fun look at the world of fashion from the pages of Delineator magazine April 1915 issue. In this issue are 2 full colored fashion pages, 10 black and white plus 4 black and white pages of garments for children. The fashion pages feature a smartness of style for seasonal dresses, suits and other wear. Just look at those hats! Oh my, some are over the top! The magazine also includes entertaining reading of short stories, recipes and helpful home hints. A page of needlework of some fun projects. Of course, don’t forget the advertising which is always a trip down memory lane.